Built in 1906, the old headquarters of the B&O Railroad remains relevant in Baltimore as the Hotel Monaco. At the height of its power and prestige, the Baltimore & Ohio Railroad was the largest railroad company in the United States and the largest employer in the entire state of Maryland. And no wonder: It operated rails in 10 states, from New York to Illinois, from 1828 until 1987, when, through a series of mergers and acquisitions, its name passed into the history books. The B&O, however, continues to exist in a couple of ways. 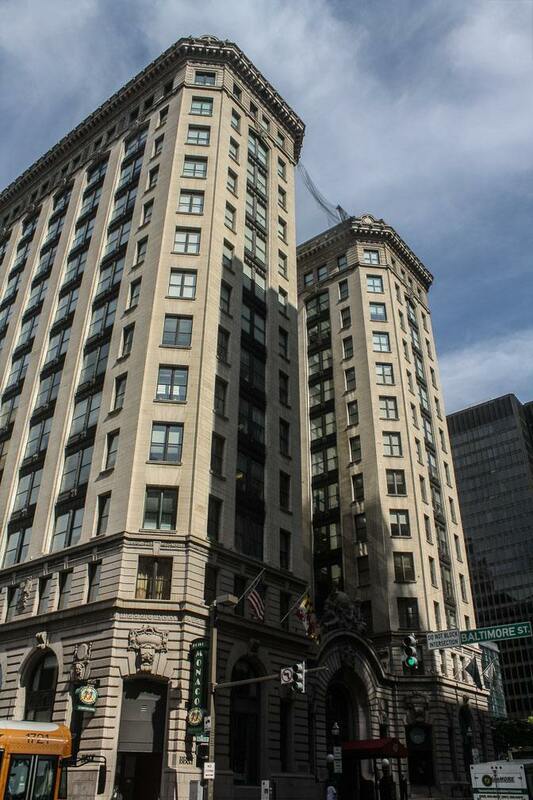 The company’s 13-story headquarters building, about a mile from the B&O Railroad Museum, has been exquisitely repurposed as the Hotel Monaco. For the same price you would pay to purchase the B&O in the original Monopoly board game — plus inflation — you can stay in one of the hotel’s 202 rooms and suites and recapture an era when train transportation ruled. Situated only about six blocks from the city’s revitalized Inner Harbor and within easy walking distance of both the historic Mount Vernon district and an outstanding dinner at Oceanaire Seafood Room, the H-shaped Hotel Monaco has commanded attention since it was completed in 1906, when it was the second-tallest building in Baltimore. Adjacent to the equally historic Lord Baltimore Hotel, the Beaux Arts structure, with its New Hampshire granite and Bedford stone façade, offers a solid indication of the stylish interior. Mercury and Progress of Industry, two perfectly fitting symbols for the B&O, still welcome visitors today. 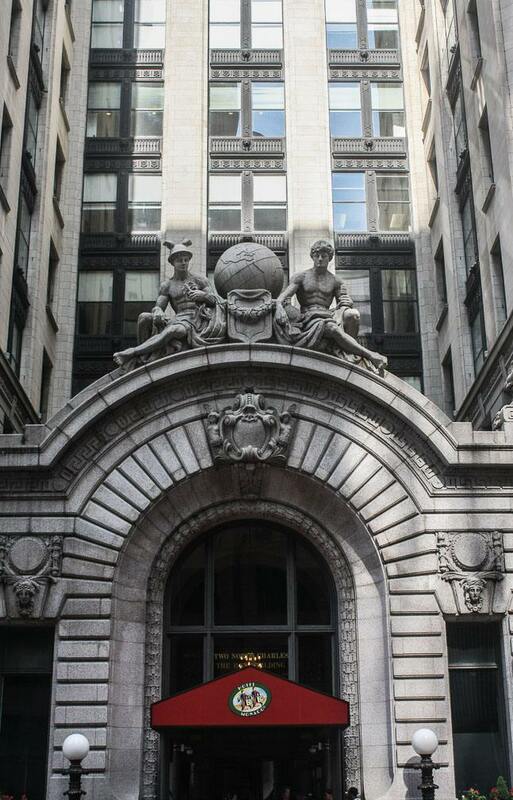 I passed through the main entrance’s arch, topped with a sculpture of Mercury, the speedy Roman god of commerce, and an allegorical representation called Progress of Industry, holding a locomotive — two figures perfectly capturing the B&O’s raison d’être. The lower lobby features an old brass mailbox and clock, and crystal chandeliers that are a throwback to the B&O’s glory days. Brass floor indicators above the elevator doors defy superstition by properly labeling the top floor “13,” unwittingly giving a nod to the company’s history that would intrigue any armchair numerologist: Oscar G. Murray, the president of the B&O when this building was constructed, began his career in the railroad business on January 13, was elected the 13th president of the company, moved into his office suite (number 13) on September 13, and could be reached on his phone at extension 13. Two grand marble staircases lead up past the original Tiffany stained-glass windows and emerge onto the main reception area, an abrupt fast-forward to the next century. The sleek lobby, appealing and crisp, is a distant cry from the Gilded Age’s grandeur. After I checked in, I was invited to utilize the lobby’s “living room” — an airy common area with abundant seating and a fireplace. In the evening, guests can match strategies over the glass chess sets or partake in the nightly wine reception. In the morning, a complimentary coffee and tea bar can caffeinate you on your way out. 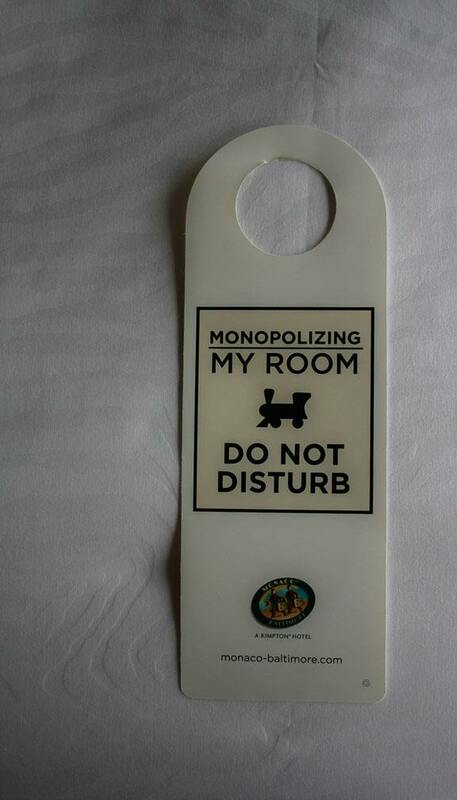 The Hotel Monaco gives an instantaneously recognizable nod to the B&O Railroad in the Monopoly board game, and gives you an undisturbed night of sleep as well. I reached my virtually soundproof room on an upper floor and took in the city views through two large windows. Aside from a locomotive etching illuminated from behind and a do-not-disturb sign playing on the Monopoly locomotive image, the Monaco doesn’t really trade on the B&O history in an overt manner, opting to stress contemporary design elements, vibrant colors, and modern amenities, such as iHome audio systems, hi-def flat-screen televisions, and cordless speakerphones with private voice-mail and computer data ports in every room. The exceptionally comfortable bed may try to seduce you into remaining idle and horizontal, but the Monaco wants to you be active, too, providing a yoga mat in every room and bicycles to borrow to explore the Charm City. As I made my way out of the hotel over the course of a long weekend — one time running into a bridesmaid who was terribly late to the reception in the hotel’s grand ballroom, another time chatting with a young Iraq War veteran with a prosthetic leg, there to spend a couple of days with his girlfriend — I always looked forward to returning to the Monaco at night, when the building’s façade was warmed by vertical red lights and the Morphean atmosphere of my room awaited me. If you intend to visit Baltimore — and particularly if you arrive by train — the Hotel Monaco will keep your plans on track with a perfection junction of historical elegance and modern conveniences.